Attorney-General of the Federation and Minister of Justice, Abubakar Malami, SAN has disclosed that President Muhammadu Buhari is satisfied with the Federal Ministry of Justice over the achievements made on the national and global scenes in the area of substantial repatriation of Nigeria’s assets stashed away in foreign jurisdictions and successful defence of high profile cases. This is contained in a statement made available to newsmen in Abuja on Friday by Comrade Salihu Othman Isah, Special Adviser on Media and Publicity to the Attorney-General of the Federation and Minister of Justice. 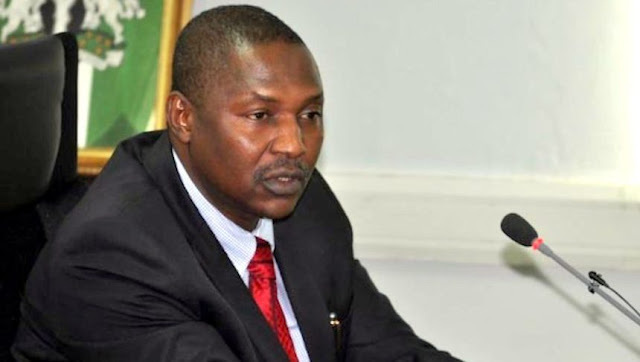 Isah revealed that Malami stated this at the 2018 Award giving ceremony organised by the Ministry in collaboration with Office of the Head of Service last Thursday in Abuja. He said, Malami enumerated that high profile cases to include the Executive Order No.6 in court which is cardinal to anti-corruption campaign, prosecution and rehabilitation of Boko-Haram suspects, legal advice to the President on legislative bills and other vital issues, resolution of public complaints and amongst others. The AGF commended the entire management and staff of the Ministry for their loyalty and support so far, urging them to remain focused and take up their assigned responsibilities with renewed vigour and dedication. He explained that, the need to acknowledge and reward staff dedication has become much more imperative in order to achieve optimum performance and work output especially now that majority of their civil and criminal cases are being handled internally. He added that, the Ministry will henceforth place high premium on staff training and capacity building coupled with the provision of financial and non-monetary incentives such as the instant event to motivate and induce best performance. The Minister further added that, the 2018/2019 legal year had been a busy one on all fronts, stressing that, the cardinal area for us have been anti-corruption drive, defence of the Federal Government and its agencies in multitude of cases which has saved the Federal Government from becoming liable for damages running into billions, Justice sector reform initiatives, promoting compliance with the Administration of Criminal Justice Act, Prison decongestion and Assets recovery’’. In his welcome address, the Solicitor General of the Federation and Permanent Secretary, Dayo Apata pointed out that the initiation of the award of excellence is not only to acknowledge employees’ contribution towards the achievement of the Ministry’s goal and objectives as recognised by the civil service rule but also to reinforce positive attitude towards work, punctuality, dedication to work, effective and efficient performance. He explained that the vision and mission of the Federal Ministry of Justice are based on values that seek to administer the law and legal affairs of the state in an open and accountable ways, adding that, this is in keeping with ideals expressed in constitution, human right. democracy, equity, human dignity, freedom and non-discrimination. In her goodwill message, the Head of Civil Service of the Federation, Mrs Wilfred Oyo-Ita stated that the initiative is to recognise and reward outstanding performance by officers across the service in line with one of the key result areas of the 2017-2020 Federal Civil Service strategy and implementation plan. Oyo-Ita, represented by the Permanent Secretary, Service Policy and Strategies Office, Dr. Magdalene Ajani further explained that the goal is to have an Efficient, Productive, Incorruptible and Citizen-centred Culture (EPIC) in the Federal Civil Service. She emphasised that the Office of the Head of Civil Service of the Federation has conceptualized the rewards and recognition system which is an effort to institutionalize the implementation of the relevant Public Service Rules on award and recognitions. She commended the visionary leadership of the AGF as well as the management team for organising the award ceremony and for their resolve to reward excellence. Director, Human Resource Management of the Ministry, Dr. Waziri Laminu in his vote of thanks noted that, the event is another milestone in the effort of the Ministry to evolve a culture where excellence is recognised and appropriately compensated. Laminu thanked the AGF and Solicitor General of the Federation who out of their ingenuity conceived the noble and inspiring venture and eventually made it possible in spite of the Ministry’s financial constraint.